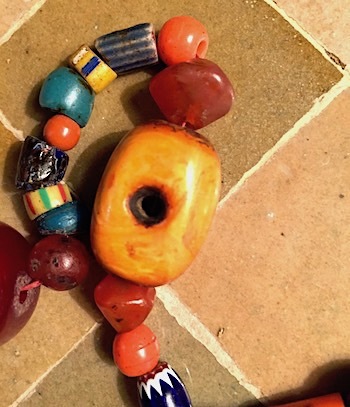 This loosely strung collection of beads were sold to me as "Berber Wedding beads". There are chunky resin items, old bits of turquoise, roughly shaped agate and a lot of nice trade beads. Also some drilled old branch coral plus a couple of crystal beads (Bohemian glass?) and too many plastic balls. But the true value rests in the two chunks of old, real, fossil amber. These have been turned through 90 degrees at some time in their history and re bored. Click on the photo to see the whole string. 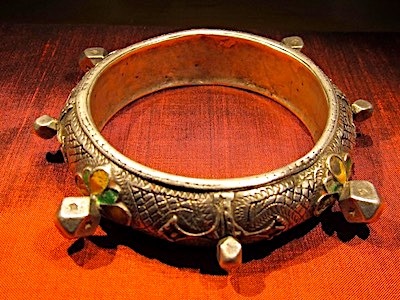 This bracelet, probably from the 1940's, is of good, old coin silver with gold and green enamel detailing. Eight flattened silver knobs provide additional decoration. 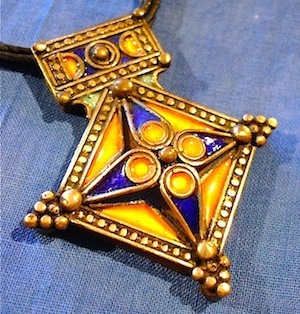 Another nice new Croix du Sud with two tiny triangles of aquamarine enamel towards the top of the cross in addition to the traditional gold and cobalt enamel. At one time this disc might have formed part of a larger element of Berber finery, but it's since been modified into a simple pendant on a slim, silver chain. 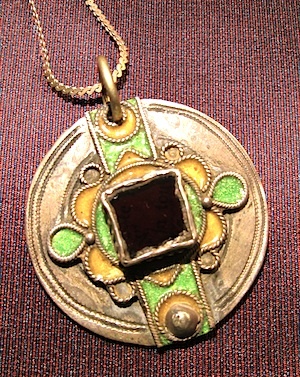 Old coin silver forms a foundation for green and yellow enamel infill, and a cabochon of deep red (so deep it looks black in the photo) contributes a striking, central feature. 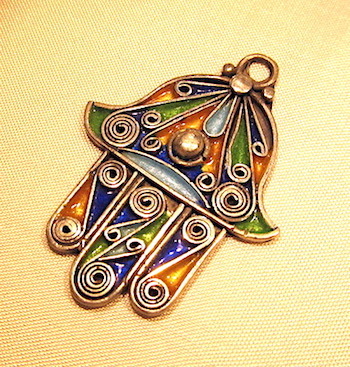 A nice, bright, khamsa with touches of emerald green, gold, cobalt blue and aqua enamel on a silver, filigreed base.